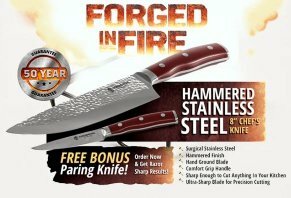 Forged in Fire Knife Reviews - Is It a Scam or Legit? Featuring surgical stainless steel and beautiful visual appeal, the Forged in Fire Knife claims it could be the last knife that you ever need to buy. The Forged in Fire Knife is an 8-inch chef’s knife that claims it may be the last knife you ever own. A promotional video for the knife shows a man in a flannel shirt using the knife to cut through a variety of things as a testament to how sharp the knife is: grapes, ice blocks, frozen ribs, a phone book, and a pineapple. The knife seems to glide through each of these materials, leading you to believe that if it can conquer these various things, it should have no problem performing the daily kitchen duties for a which a chef’s knife is designed. The knife is named after Forged in Fire, a History Channel show in which the host recreates weapons used throughout history, including Medieval times. In our review of this knife, we’re going to talk about how it works, analyze the pros and cons of stainless-steel knives and address the Forged in Fire knife’s pricing, return policy, and 50-year guarantee. The video promoting this knife is pretty impressive. In addition to cutting through the things we mentioned just a few seconds ago, the video showed the knife cutting through a series of filled water bottles as well as an ice block. After each one of these seemingly tough challenges, the knife would go on to do delicate knife work, cutting ultra-thin slices of grapes and gliding its way through a kiwi. For anyone who’s had to deal with a dull knife, these types of images are most certainly a relief. The key to this blade’s effectiveness, its site says, is the fact that its forged from surgical stainless steel and professionally sharpened before it reaches your home. There are no claims to any special hardening processes or techniques. What leads to a knife’s longevity is the type of material from which it’s made. In this case, the material is surgical stainless steel. According to Science Direct, this phrase refers to a type of steel that can be used in surgical procedures such as dental and joint implants. This type of steel is resistant to corroding, which makes it good for high-demand tasks like cutting. However, there isn’t just one type of surgical steel. There’s a grading system for stainless-steel knives – 440, for example – that indicates exactly how good it is. The Forged in Fire site did not provide any details about the grade of the steel used in the knife. Through our research of knife forums and various knife sites, we saw several people and one expert say that knives that advertise “surgical stainless steel” tend to be cheap. However, because we don’t know the grade of the Forged in Fire knife’s steel, we can’t say for sure whether it’s low- or high-quality steel. When knifemakers create a stainless-steel knife, they use stainless steel that includes various elements like carbon, chromium and more. The extra elements add strength to the blade as well as rust-resistance. High-carbon steel knives tend to be a little stronger than stainless-steel knives and have a sharper edge, KnifeWorks.com notes. Price-wise, the cost of a stainless-steel knife varies, mainly due to what we pointed out earlier – that there are different grades of stainless-steel knives. We searched “surgical stainless-steel chef’s knife” on Amazon and found a long list of results of various types of stainless-steel knives. Comparable knives included the OOU Pro Chef knife and the Dalstrong Chef’s knife. The OOU knife was $29.99 with free shipping along with a high-carbon blade. More than 25 customers gave this knife an average rating of 4.8 stars. The Dalstrong wasn’t available at the time, although its black-titanium coating and high-carbon blade earned 4.6 stars from more than 30 reviewers. At the time of publishing, you could buy one of these knives along with a smaller paring knife for $29.95 plus $8.95 for shipping. If you order a second set of knives, you’ll get free shipping. The company who sells these knives, Halex Holdings, offers a 30-day guarantee for the knife. According to the fine print, “if you are not completely happy with your Forged in Fire product,” you can call 800-300-3465 or email customerservice@shopforgedinfire.com to start your return. The 30-day deadline begins the day the knife is delivered to your home. Also, the fine print says that cosmetics and wear and tear that comes from daily use are not included in the warranty, either. In other words, if the knife dulls over time through normal use, you can’t make a warranty claim. You’ll have to contact the company through the phone number or email address to start the warranty. Furthermore, you’ll have to pay a $9.95 shipping and handling fee to make the warranty claim. Based on our research of this knife and the prevailing information about various stainless-steel grades, we believe this knife has some clear strengths and weaknesses. First, we think that the company has done a great job of designing the knife, as it is a great-looking kitchen tool compared to some of the options we viewed on Amazon. With that in mind, we think that the post-shipping price of around $39 is relatively reasonable considering you also get a paring knife with your purchase. That being said, we believe that there may be better knives available for purchase on Amazon, especially when you consider there are highly rated knives with high-carbon steels that, according to the experts, will keep their sharpness longer than a stainless-steel knife. You also have the advantage of using Amazon Prime to ship the knife for free, whereas shipping for one Forged in Fire knife is $8.95. I've been a professional chef for 20 years, everything from 5-star 4-diamond dining to fast food. I've used many a knife, never actually owned my own until my son got me the Forged in Fire set. I was looking at more expensive knives, figuring that's what I need for the pro kitchen. I was very skeptical when these knives showed up wrapped in plastic like a matchbox car, but I gave them a chance, and I'm glad I did. It's been about three, maybe four weeks, I've used them every day, and yet to sharpen them. I've dropped the chef knife just yesterday and it survived without a scratch. I actually look forward to going to work just to use these knives, and at the price, I wouldn't tell a friend, I'd do what my son did and buy them a set. The ONLY downside is they don't come with a case or sheath to protect the blade when I'm not using them, I had to buy edge guards and a knife case for them. I have watched the show for a while and have bought several brands of knives in the past. Not finding that special feeling between other knives and my hand I purchased the product. I received it three days earlier than I expected and opening it up like a kid at Christmas I began doing a little test to check the sharpness...now I have a hairless forearm paper thin tomato slices. The knife cuts straight and true because it is a heavier weighted knife. I can’t wait to see what knife will be offered next. Maybe a 5 and 9-inch fillet knife for a tackle box or one for skinning a tomato or an 8-10 chopper? I will buy again. Write a Review for Forged in Fire Knife!